Thirsty Pilgrim: What Passes for Premium Beer? A friend of mine recently had the chance to chat with an executive from Cerveceria Costa Rica, the monopoly that runs things around here. My friend said, "So you guys must control about 85 percent of the beer market." And the executive said something like, "Ho ho ho, it's more like 97 percent. Our marketing departments are in fierce competition only with each other." True story. And it says all you need to know about the flavor of their products. Honest question: What is a "premium beer"? Cynical answer: It is a way to package inoffensive lager at a higher price point. And that says all you need to know about Bavaria 1460. Among the desperate few who've bothered to taste all the lagers here, this one is usually considered the best of a poor lot. It does have a gorgeous copper color. It does have an impressive label, and I've never seen it in cans (another sign that it is "premium"). There is a certain delicate malt backbone and lightly bitter bite to it... But you can say the same for any of the others, if you pay attention. So this is what you might drink here, if you had to choose among the products of the various CCR marketing departments. But I'm painting a very sad and desperate picture. What we really want to talk about (don't we?) is that other 3 percent — which is suddenly getting a lot more interesting around here. I'm seeing tiny wedges in the cracks, and diminutive feet in the doors, of the Costa Rican beer landscape. Which will serve as well as any other for an ongoing case study in the global reach of craft beer. Any educated guesses on the significance of the year 1460? For the life of me I can't figure it out. Columbus was 9 years old, so it's not the discovery of the Americas. Maybe it is some significant date in German brewing history. Or maybe it's just a nice round number. 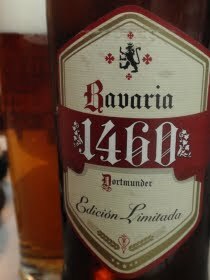 How bizarre, the English wikipedia page for the year 1460 said "[[March 7]] The Bavarian original formula is discovered in Dortmund, Germany" -- until I deleted it because I was unable to find any reference to this event in Wikipedia (it does not appear on the German 1460 page), nor elsewhere in the internet. Who knows, maybe this line was written by the CCR marketing department. That is strange. I haven't been able to find anything tangible either. Time to bring in a German beer history expert.